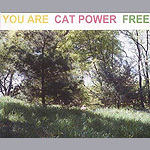 "You are free", is the long-awaited release of new material from Cat Power (better known as Chan Marshall). It has been a while coming and the question must be, has it been worth the wait? 30 seconds into the first track, I can say yes. Well sort of. 'I don't blame you' is the sound of a fragile Tori Amos, but manages to keep to the 3-minute mark, which is something that Tori unfortunately fails to adhere to time and time again. The thin, angular acoustic guitars that launch 'Free' reminds us what Marshall does best - makes the sublimely simple look complicated and layered. Her voice appears to have lost a bit of the rather irritating Riot Grrl snarl and the gentler vocals actually appear to pronounce the songs more than before. Her trademark sound of lazy guitars mixed with violins and wandering vocals resurfaces on 'Good woman'. Her folk-tinged voice brings back memories of the legendary Jeff Buckley. She has the same beautiful frailty to her voice as the much-missed Buckley had. Chan Marshall is a well-respected singer-songwriter and this is obvious when you take into account her 'friends' such as Dave Grohl and Eddie Vedder jumped at the chance to appear on this album. 'Speak for me' is the sound of The White Stripes and a certain British artist - it always amazes me that Beth Orton is not compared to Chan Marshall in anything I have ever read. Anyone who doesn't see this link is clearly not paying attention. If you were to take the acoustic guitars from Orton's recent album "Daybreaker" and electrify them, you would get a mirror image of this CD. The charming blues tinge in 'Baby doll' provides a lovely break from the otherwise trashy folk-pop nature of this album, but does becoming quite boring after a while. Closing with 'Evolution' featuring the dark, deep vocals of Eddie Vedder, the album departs on quite a lonely note, but it does seem to have an "until next time" appeal to it. Although still emotionally charged, it appears Marshall's outlook on life has brightened since the troubled "What would the community think" and "Moon pix" albums and I am not sure if this adds or takes away from her. Lyrically quite poor, musically good, but a little samey, this release does not quite match the brilliance of her earlier work but don't write her off just yet.